A meteorite is a fragment of rock or iron from outer space, usually a meteoroid or asteroid, which survives passage through the atmosphere as a meteor to impact the surface of the Earth. Meteorites are believed to be originated in the asteroid belt between the planets of Mars and Jupiter. A meteorite may range in size from less than a gram to more than 60 tons. 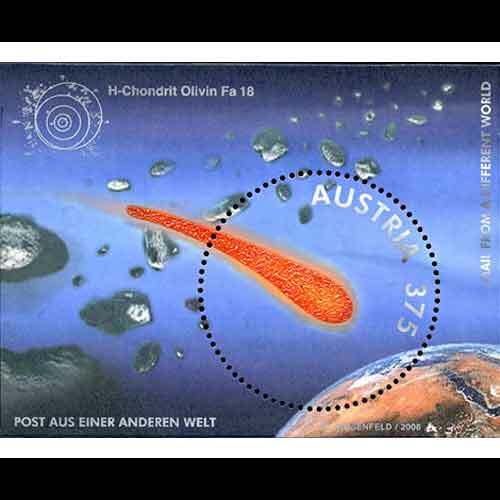 In 2006 Austria Post has issued a stamp with Meteorite dust. The dust came from a 19Kg stony meteorite found in Morocco in 2004. The meteorite was crushed into a very fine dust and 0.03gms of that dust was hand affixed to the stamp using special adhesive.